Radio Blekinge has annouced today that Daniel Ivanovski the Macedonian player had signed a new contract with Mjällby. This is an excellent news for the defense. Ivanovski had done an excellent end of season last year before getting injured for the last games. Reproduction of images from the Ze French Minks is not allowed without permission of the author. 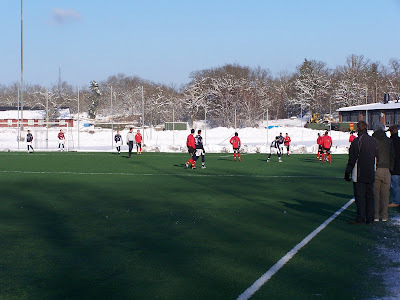 Here are some pictures from the game of last saturday. Thank you LörbyMinken specially for the ones bellow showing the goal of Mjällby by Daniel Nilsson on a free kick of Alexander Malmström. Reproduction not allowed without the authorization of the FrenchMinks. Good game of Marcus Ekenberg. Corner from Marcello and goal from Ekenberg. Marcello and Seften both player from Kristianstad in 2006. 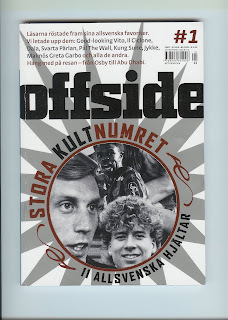 I suppose all you MAIF supporters who can manage to lay hands on the great swedish Football magazine, OFFSIDE, and can manage to understand Swedish, has alredy read the mentioned magazine´s last number. For you who not yet has had the luck I strongly recommend it! 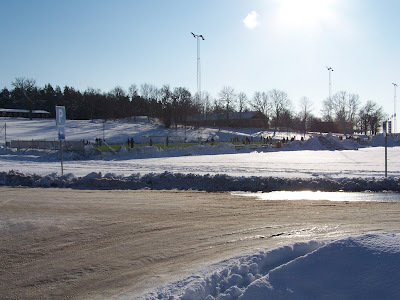 In the first number of 2007 Mjällby AIF is mentioned in at least three places. It is a rather nostalgical number with interviews and other with old favourite players. 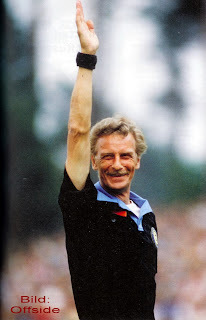 For example you can read about ex referee Efon Ask - legendary in the 80´s. Who can forget when referee Ask gave himself a yellow card after realizing he himself had made a mistake. 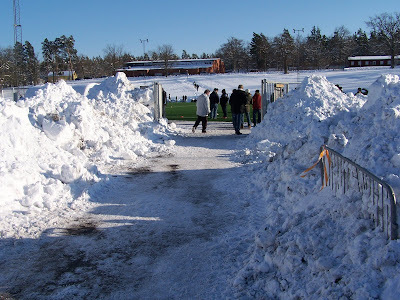 Even if that mistake might have cost Mjällby a place in Allsvenskan. 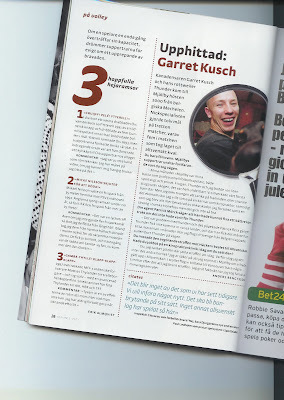 There is also a shorter interview with Garret Kusch - the player who scored twelwe goals in thirteen games and then disappeared. 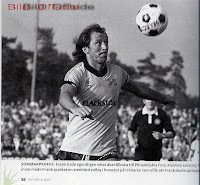 He claims to have had his best time as a footballplayer in Mjällby AIF. A long interview with one of Englands top scorers and a player in the class of George Best. 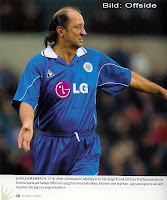 The man who came to help Mjällby to stay in Allsvenskan and spent one summer on the Hällevik beach and a lot of time at the Hanöhus night club - Frank Worthington. He is one of eleven selected favourites of Allsvenskan. All pictures from OFFSIDE Magazine. 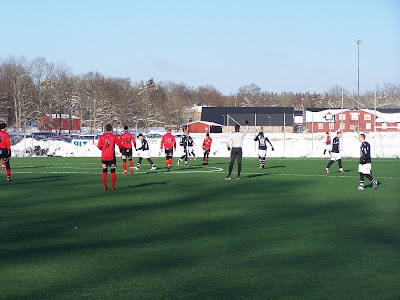 MAIF played its second training game of the season against neighbouring Kristianstad (including ex-MAIF players Senftén and Boven, but not new promising recruit Stefan Larsson from SGIF). 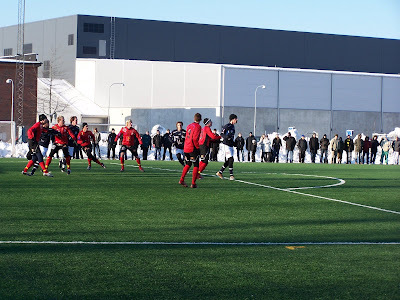 The game was played on the artificial grass plane of Rosenholm, outside Karlskrona. It was quite funny to see this much green in the middle of all the white. It was sunny and almost no wind, but quite cold as well. As the score can indicate, MAIF was in control of the game. Kristianstad did start quite agressively, but the defense was strong and did not let much through, and new goalkeeper Fransson (man this guy speaks a lot) was always ready. The instructions were quite clearly to build and bring the ball up through passes, and not just throwing the ball away. It did work, and very well at that. Even in difficult and very closed situations, the players found a way out and brought the ball up (actually the only one time the ball was thrown away it was lost, as yet another proof that it's not the right way to go). It was a real pleasure to watch football of that quality. Except for Dusan, the whole team got some play time. Berner was like last year, very quick, very agressive. He missed a one-on-one situation, but did the assist on the 1st goal. Eken played a little easy at times, but did (as often) score, both the 1st and 3rd goals. From what I could hear he did not like the artificial grass. At all. Alex was excellent today, he was everywhere, involved in most actions. He scored the 2nd goal as well. The defense line (initially Tobbe, Lindberg, Cederberg, Wille) was stable. Danne was not in his best shape today, not very inspired, backing a lot when there were openings up, late in many interventions. As to the newcomers, Patrik made a very good first impression, played simple and efficient, good vision of the game, good timing. Marcello replaced him for the 2nd half, working a lot, good impression as well. Besim I only saw from very far, so I don't have an opinion. Then there was all the youngsters, I don't know the name of half of them, but they showed good level as well. Some lack of routine, not unexpectedly, but they where holding their place. That's very good news for the internal competition. 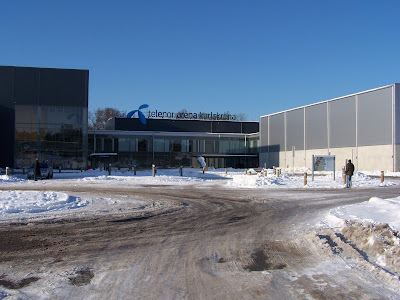 We did not see Sasa, the Johan's (Svensson and Persson) and Simon. So no idea where they are in their preparation. Finally, the line referees were not in their best shape either, finding a couple of imaginary offsides (remember, offside is when the ball starts, not when it arrives). 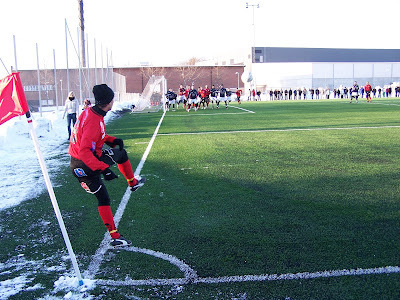 Anyway, this was still training, there is still time to fine-tune things before the season starts. MAIF showed some good qualities today. If we see the same play level with adversaries of closer level (Kristianstad plays in the 3rd league), then we will have a good season.